I have absolutely awful eyesight. My mom blamed it on the fact that I hate carrots so I never ate them when I was younger. But new studies have found that video games can be better for your vision than carrots. So really was I not eating enough carrots? Or was I not playing enough video games? Researchers have found that action-based video games can improve contrast sensitivity – a vision feat that usually worsens as you get older. One study measured contrast sensitivity at several spatial levels in subjects with lots of experience with action-based video games in comparison to those who had virtually no video game experience. They found that the video game players had higher contrast sensitivity on a majority of the spatial frequencies than the non video game players. Could the increased contrast sensitivity also be due to good genes? Both my parents have awful eyesight, so I always assumed that that was why my vision was awful. Reverse causation can definitely be ruled out as just because a person’s eyesight is sufficient does not mean they will play more video games. I am unsure of how many subjects were actually studied in this case, so there is a possibility that the sample population is not accurately representative of the population as a whole. In another study, researchers took a group of non video game players and put them in video game “training”, where they played a video game for 50 hours over a nine-week period. Half of the subjects were assigned to an action-based video game while the other half was assigned a non-action stimulation-based video game. When measuring contrast sensitivity for both groups, researchers found that significant improvements were only found in the group that played the action-based video games. Will these results be consistent amongst all age groups? 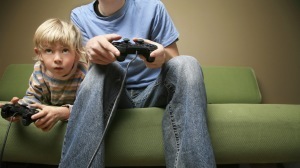 Or are action-based video games most effective when played at a certain age. Also, we should consider other effects that video games have on children, such as the development of ADHD. Although video games have been found to improve contrast sensitivity in several studies, we must also keep in mind that other health issues can be a concern. After all, if a child is sitting in the house playing video games, he’s not outside being active. Moral of the story, I should have eaten my carrots, but at least I wasn’t stuck inside playing video games all day, even if they can improve my eyesight.